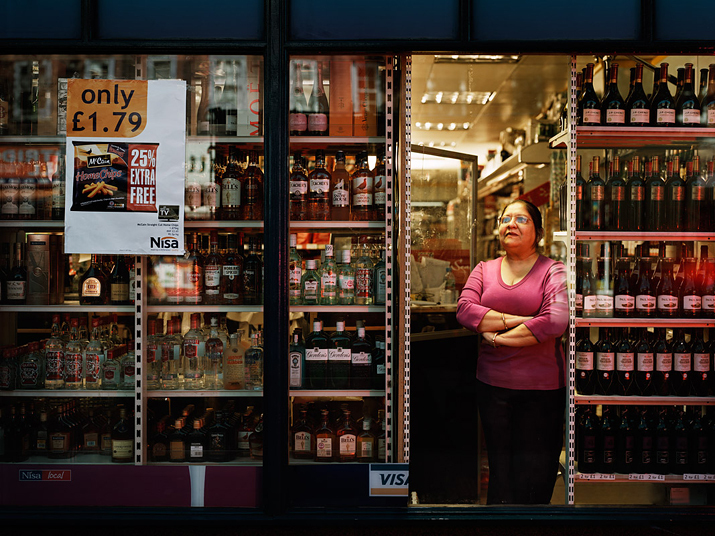 Mrs Darsham Patel, Nisa Food and Wine, Archway. © Dylan Collard. Booze in quantity: voluptuous and magical. There’s even a wistfulness in the expression on the face of the proprietess as she stands guard over (in all probability) a few grand’s worth of drink, as if it’s enough just to be close. It’s a bit like an fabulous picture I once found in a Paris Match from 1952: a French family of four, posing with their entire annual food and drink consumption – Ce Qu’une Famille Française A Mangé Cette Année. As you might expect, it shows two small parents and their two small children surrounded by everything they nominally consume in a twelve-month period: a double-page spread of scarcely credible eventfulness, containing entire sides of beef, whole pigs, several metric tonnes of bread and potatoes, some game, a lot of charcuterie, and, of course, alcohol. Three hundred litres of wine; one hundred and sixty-eight litres of beer; fifty-eight litres of cider. The bottles are set out at the feet of the little quartet like a stockade, behind which they sit with understandable complacency. It is described as une ménagère économe, which nonetheless enables the mother and father to absorb well over a litre of booze a day between them (the kids are plainly too young), to say nothing of the apéritifs and digestifs (about four litres’ worth) which also grace the photo. As an advertisement of French priorities, it is hard to beat; and even now, has a cave-of-wonders feel which combines with a nostalgia for something one has never actually experienced, in a deeply affecting whole. But it’s only the drink which makes one feel truly sentimental. The fascination of the stuff, bottled or poured, is really an inheritance from childhood – when it was not just dazzlingly jewelled in appearance, full of complex and occult signifiers, but also forbidden – and as such contains longings which are deep, unresolved, inadmissible. Just look at all that booze, glowing with the same coral intensity as the proprietress’s stretch top! How can she stand there so calmly? Charles Jennings blogs on wine and other forms of drink at Sediment (‘I’ve bought it so I’ll drink it’). 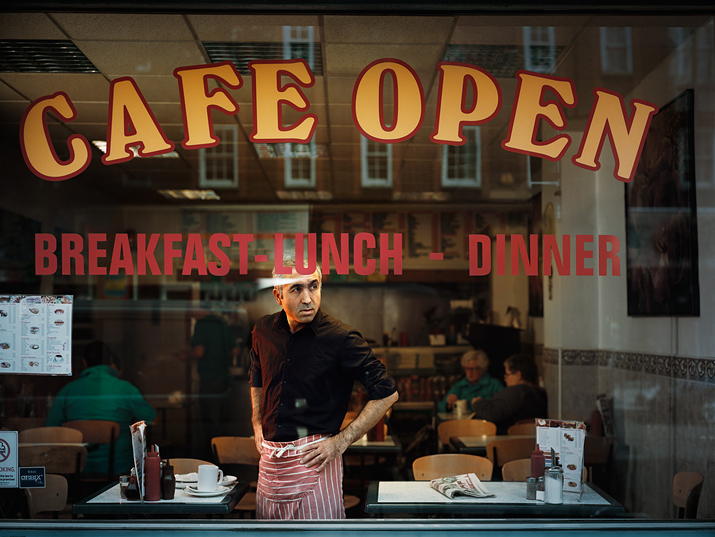 Up My Street is Dylan Collard‘s project documenting shops between Kentish Town and Archway. His exhibition The Twelfth Man is currently showing at Exposure Gallery, 22-23 Little Portland Street, London W1. Dylan is represented by the Vue agency. 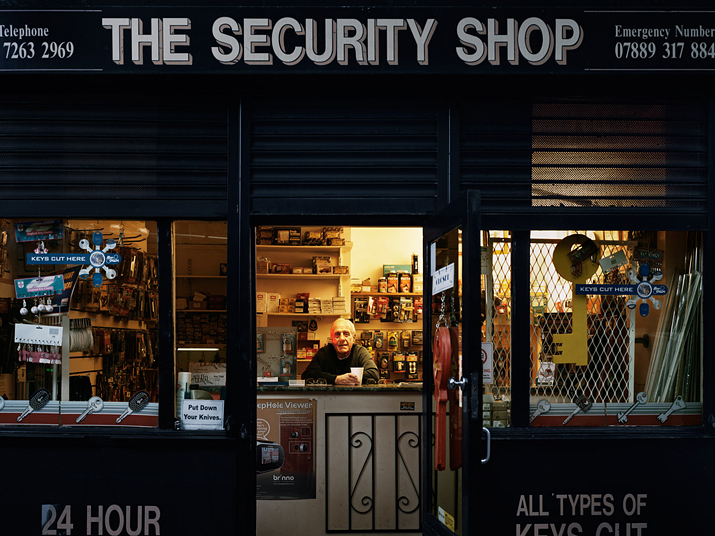 The Security Shop, Junction Rd., Archway. © Dylan Collard. The Security Shop is, as you would expect, a local locksmiths and one that only opens when the owner fancies opening up. He doesn’t really open in the winter because it’s too cold just to sit in the store … The store is opposite the Wedding Shop and the Blue Carbuncle both of which feature in the series, but that have now both been forced to close. Unlike the other shopkeepers on the road, the owner here is hoping for the arrival of a Tesco’s as it will bring in more customers. 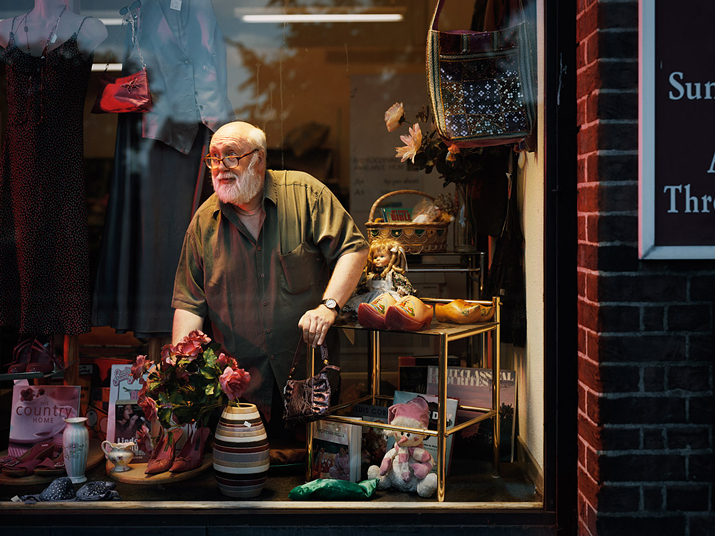 Up My Street is Dylan Collard‘s project documenting shops between Kentish Town and Archway. His exhibition The Twelfth Man is currently showing at Exposure Gallery, 22-23 Little Portland Street, London W1. Dylan is represented by the Vue agency. The Archway Cafe. © Dylan Collard. The genius of photography is the commemoration of the ephemeral; this is the reason why some of us are beady on the subject of digital photography, as it represents the commemoration of the ephemeral by means of the even-more-ephemeral. No such qualms arise from this week’s images by Dylan Collard, which were made using defiantly old-school methods. For his photos documenting the Holloway Road, Dylan lugged his massive Gandolfi ‘field’ camera (a device the size of a large hatbox, bolted to a hefty tripod) up and down that windswept, Stalinist boulevard to record scenes as quotidian as one could imagine. In today’s photo, the proprietor (it can be no-one else) of the Archway Cafe poses for the camera in a way that we believe – we know – to be characteristic. Of course, he is having us on; he is playing the part of a surly cafe owner for our benefit, he knows that he is being memorialised for posterity – and Dylan’s limpid image preserves the shrewd glance of this short-order chef as if in amber. Yet, if current trends continue, this commonplace scene is likely to disappear within a few years. The formica and the plastic condiment bottles already look like period pieces in this context, where they are employed as functional items rather than archly retro decor. This is not a cafe for budding screenwriters with their MacBook Pros, or middle-class mums with Range Rover-sized prams and Orla Kiely infants, but it can only be a matter of time. The hipster-friendly make-over of the Holloway Road is upon us with the inevitability of a melting ice shelf. And perhaps that is why our man in the Archway Cafe is so watchful, he might be keeping an eye out for the wrecking hordes: the girls with oversized glasses, cut-off shorts and day-glo leggings, the thin young men with buttoned-up plaid shirts, skinny jeans and implausibly bushy boybeards … an army of destruction as potent as any in history. Elizabeth Sullivan, Beautiful, Holloway Road. © Dylan Collard. Elizabeth Sullivan was born in Hackney in 1991. She moved to Liverpool Road until she was 6 and then moved to Penn Road just off Holloway Road where she has lived since 1997. She has worked as a Beauty Therapist at Beautiful at 639 Holloway Road since 2010. The discreet charm of the A102M. Photo & text: David Secombe. 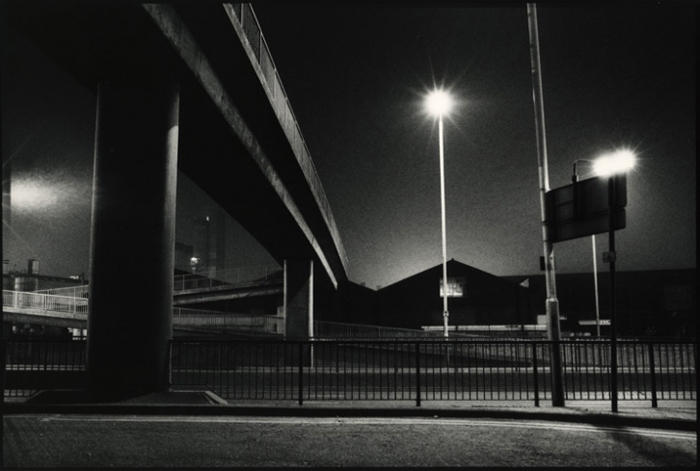 Posted: September 13, 2012 | Author: thelondoncolumn | Filed under: Literary London, London Places, Transport | Tags: blackwall tunnel, charles dickens, Special Patrol Group | Comments Off on The discreet charm of the A102M. Photo & text: David Secombe. Blackwall Tunnel southern approach, SE10. Photo © David Secombe 1988. Some years ago, a temporary inability to sleep, referable to a distressing impression, caused me to walk about the streets all night, for a series of several nights. The disorder might have taken a long time to conquer, if it had been faintly experimented on in bed; but, it was soon defeated by the brisk treatment of getting up directly after lying down, and going out, and coming home tired at sunrise. In the course of those nights, I finished my education in a fair amateur experience of houselessness. My principal object being to get through the night, the pursuit of it brought me into sympathetic relations with people who have no other object every night in the year. DS and two PLAIN CLOTHES OFFICERS in front of a taxidermist’s window. About 3 a.m. PLAIN CLOTHES 1: Who are you then? DS: (produces card) That’s me. PLAIN CLOTHES 1: So what are you doing? We saw you walking out of that alley. DS: I can’t sleep. I have people in my front room, so I thought I’d go for a drive and maybe take some pictures. PLAIN CLOTHES 1: Bit dark isn’t it? PLAIN CLOTHES 1: You ever been arrested? PLAIN CLOTHES 1: Oh all right. (turns to face taxidermist’s window) What do you think of that kestrel? Clever isn’t it? Wouldn’t want it in my house though. PLAIN CLOTHES 2: That’s not a kestrel. It’s a falcon. PLAIN CLOTHES 1: What’s the difference? PLAIN CLOTHES 2: Plumage. A falcon’s got different plumage. And a flatter head. PLAIN CLOTHES 1: Don’t you start. … for The London Column. © David Secombe. 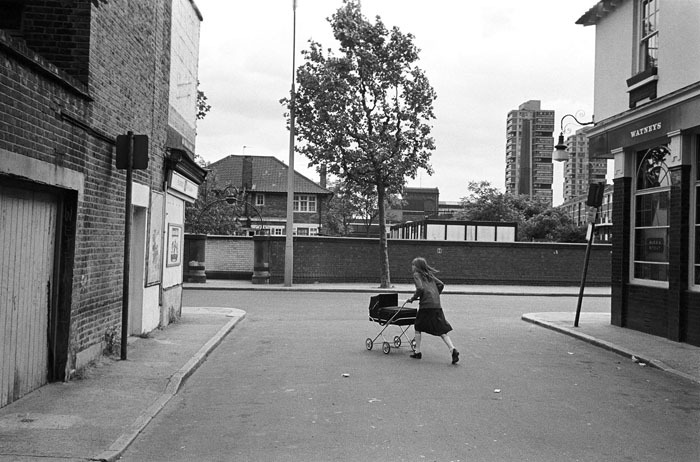 Brunel Road, Rotherhithe, London, July 1979. © Geoff Howard. This car is following me. No, either it’s following me – dark blue Golf – or it’s as lost as I am and just happens to emerge and re-emerge round corners and at the ends of roads and roll silently past me, the driver painstakingly not looking my way but screwing up his brow as he lunges off up another sidetrack which I know will bring him out twenty yards ahead of me. This is paranoia all right, and I’ve only been here 15 minutes. Another thing: after a lot of ducking and weaving, I shake the car get onto the street that runs down by the river, two apes start following me, cropheads, bomber jackets, you know the sort, bouncers. Didn’t say anything, mark you, just kept their distance 30 feet behind. Nice sunny day, but I still felt that unease. So I jinked behind a litter bin, doubled back round a newbuild block of flats, nipped out on Salter Road, turned round a couple of times, lost them. Close though. I don’t normally act this way, but Rotherhithe is not on the level. It was a perfect day, breeze blowing, sun shining, operatic clouds billowing up from the south-west, and yet such is its emptiness, the untenantedness, the shortage of humanity around Rotherhithe a lot of the time, that I can’t remember the last occasion I felt so alone in the big city except when I was last down the wrong stretch of Wapping, the sister city across the Thames. Here they were, of course, Wapping and Canary Wharf, I could see them standing golden in the sun on the north side, while kids combed the shingle beach for pounds. Alone and lost. Just me and ranks of newbuild properties – little three-bedders with oak-effect doors, new wave flatlets topped off with pointless metal triangles and overturned D’s; refashioned warehouses on the river; fake Georgian tenements – once in a while interrupted by a canal or dead creek with tide heights marked in Roman numerals up the side, all doubling back on themselves, leading in and out of nowhere. Not even any shops to get some sort of bearing, apart from a pair of bolted and shuttered takeaways next to a Stop ‘n’ Shop and the The Compasses pub. I clung to this last for a bit, going round in circles, afraid to lose it and myself again – before I realised that I had to be somewhere else in an hour and a half and that if I didn’t start looking for a way out, I’d never leave in time. So it was off to the Dan Dare tube station where I thought I’d arrived a lifetime earlier, and back over the scrap of wasteland – where I finally saw a couple of people, trudging into the distance, carrying bags. And then a terrific racking cough, like a bomb going off, and this wrecky old geezer lurches out from a bush and makes for a bench. I was going to hail him, winkle out the secret of Rotherhithe, the two worlds. V-reg cars penned in behind security fences (“Specialist Dogs and Tactics” it said on a notice on one) versus the tough old estates left behind, but then another of those blokes appeared – no. 1 crop, Crombie, pit bull on a string. I thought “Hallo,” like you do, and bunked off quick. Rotherhithe Photographs: 1971-1980 by Geoff Howard is available direct from the photographer at £25.